With the NBA Playoffs right around the corner, and the Kevin Ware fueled men’s college game in the rearview, here’s to the ladies. The face of women’s college basketball for the past two years has been Brittney Griner. Brittney initially exploded onto the national scene with superficial criticism regarding her physique, followed by multiple in-game dunks, and highlighted by a National Championship last year. This year, after cruising through an undefeated regular season, her Baylor Lady Bears cruised into the Elite Eight of this year’s tournament before flaming out against the Louisville Cardinals. Brittney’s final season should be remembered for her bold proclamation: no one can beat us except for the Miami Heat (in the midst of their historic win streak nonetheless). I had the privilege of watching the second half of their collapse, and must commend Odyssey Sims on her performance for the Lady Bears; to imply that Brittney threw that game would be an understatement. Although Brittney was offensively limited due to constant double teams from a zone defense, she disappeared completely on defense and watched a layup line ensue. 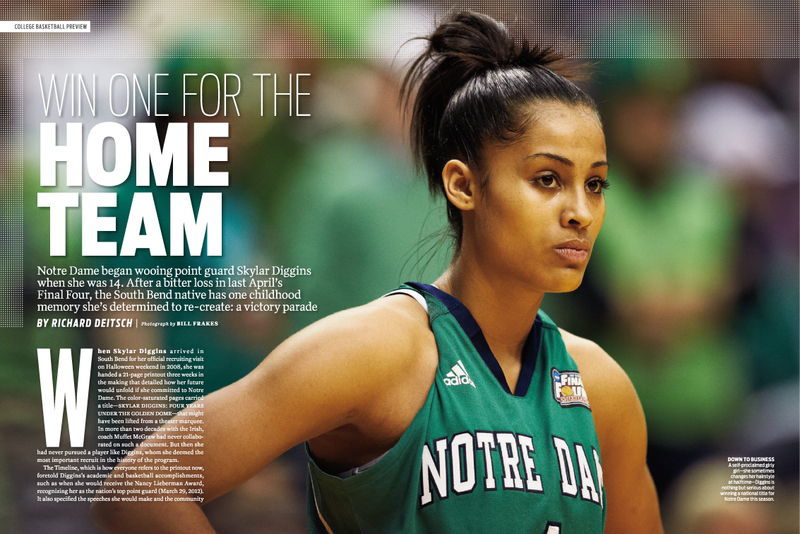 With Baylor gone, the nation turned to Skylar Diggins and Notre Dame to carry women’s basketball athletics into the limelight. Immediately following Brittney’s sellout, we were treated to an emotionally charged Skylar carrying Notre Dame into the Final Four. Notre Dame then lost their next game, and the Connecticut Huskies subsequently won their eighth national championship. For perspective, Connecticut and Tennessee account for sixteen of the thirty two national championships in NCAAW basketball history. As it turns out, I can’t recall who won Most Outstanding Player, or name any of the Connecticut players after Maya Moore and Tina Charles left; alas, their coach, Geno Auriemma, is who will be remembered. The women's game needs marketable names, not Mark Cuban instigating the likelihood of a woman in the NBA. Elena Delle Donne of Delaware is the favorite to usurp the title during her senior season. While we’re aware of Andrew Wiggins and Jabari Parker entering the men’s college ranks as definite one and done lottery picks, it’s far more difficult to stay abreast of incoming female stars. Pay attention, as the weather warms and women storm the courts in ever increasing numbers, because they’re so far under the radar, it’s not far-fetched to find yourself playing with one.